My 2nd attempt of solo travelling. A simple, low-budgeted and a short trip.Nevermind if I missed some important attractions as plenty of memories that i could keep to myself. Here are some highlights during one of my solo travels. I took a bus ride from Krabi International Airport to Ao Nang approximately 30-45mins for 150 Baht which bring me somewhere near my hostel. I stayed In Ideal Hostel booked for 3 nights and its a 4 bed-mixed dorm. Sadly, nobody was in my dorm yet and at that moment, Loneliness struck, planless and with a hungry belly, I went out of the hostel to get some food. After having the mediterranean food for my first meal in Krabi, I decided to head to Ao Nang Beach catch the sunset.The hostel location was so convenient because the distance to the beach is just a min away. I returned back to the hostel, still no one yet. I was thinking what I’m gonna do the next day. 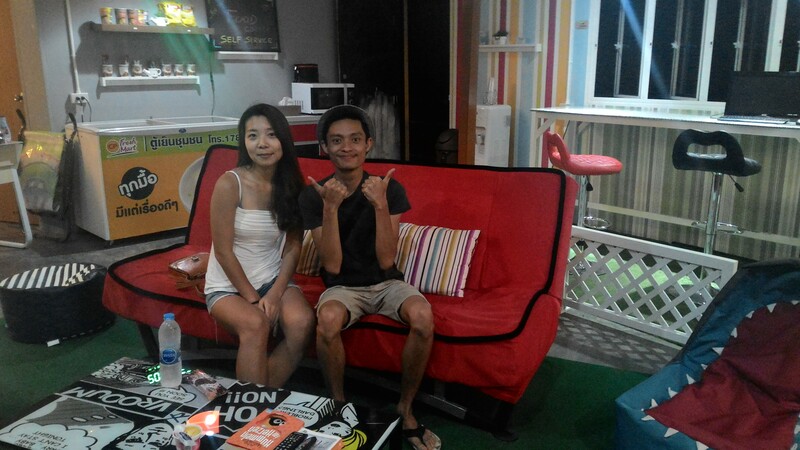 I spent the rest of my time talking with the hostel owner, giving me tips and what Ao Nang could offer me. I head to a simple dinner before heading to bed, looking forward for the next day. I woke up in the morning, prepare myself and made an impromptu plan. I just head to a long-tail boat somewhere around the beach and headed to the four islands. (Tup Island, Poda Island, Chicken Island, Phra Nang ). I was glad, as there is a solo traveler from Korea, Park who joined the same boat as me. I made the first move and introduced myself. We then engaged ourselves in conversation about our culture.Even though we had some of a language barrier we are still keen to communicate and used google translate to keep the conversation going. We spend the rest of the day adventuring together.At the end of the trip, we exchanged numbers and plan to head for dinner that night. I returned to hostel and with a good news, 2 women are in the same dorm as me, meaning no more sleeping alone. One was from Cyprus aged around mid 30s and another was Korean, aged late 20s. Each of us introduced ourselves and we had a normal conversation between us about traveling. I feel more comfortable talking to Hana who is from Korea as we share common knowledge as our age range not too far apart. It’s dinner and time to meet Park. 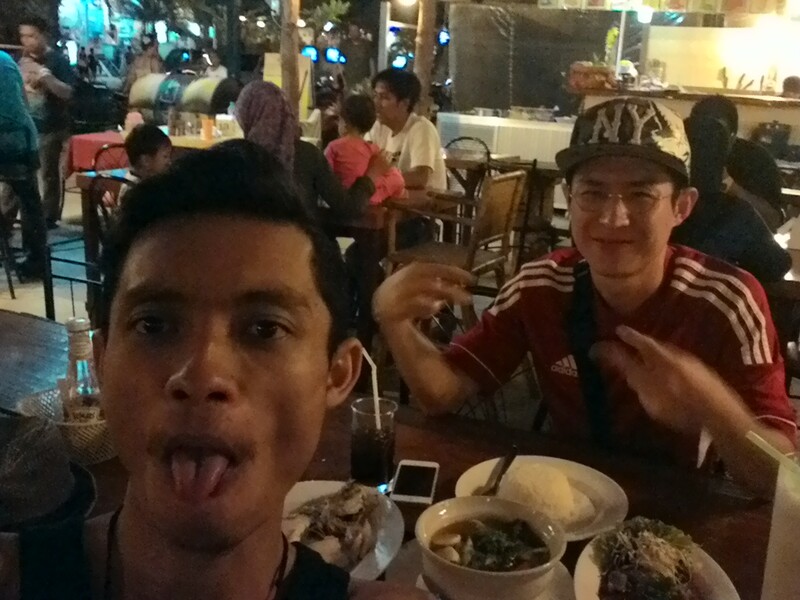 We hunted for seafood in Ao Nang and thankful to him for the treat. He told me he will be heading to Bangkok for Laos tomorrow morning. I was a little dissapointed at that time, getting to know that he is leaving when we just met. I wished him the best on his travelling journey. It’s Day 3 and my final night in Ao nang before moving off to Koh Phi Phi, i tried for a tour this time round for a good bargain which brings me to 3 main attractions, Hot Stream, Emerald Pool and Tiger Cave Temple. 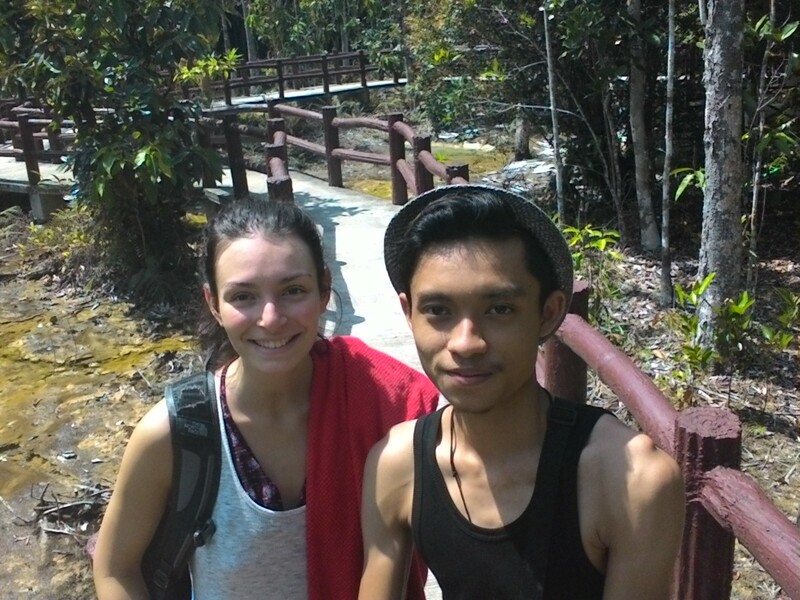 Along the way, i met the friendly Sarah from Germany which is staying in the same hostel as me. 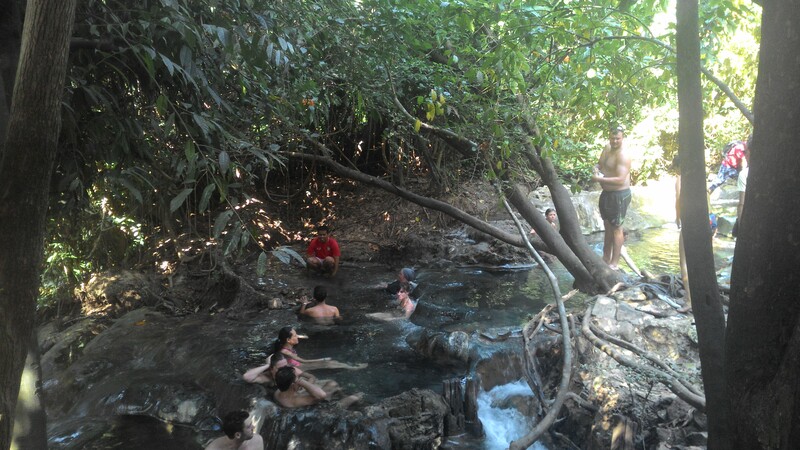 Hot Stream, the pool that you just dont want to get out from it. Tiger Cave Temple, conquering 1,237 steps in like a never ending ascend but the view was rewarding in the end. When, I got back from from that trip, I called-off my plans to Koh Phi Phi, the friends I met so far had been terrific. Furthermore, I do not want to rush myself to cover as many places as I can. I decided to extended my stay for the rest of the trip.As the room is full, I shifted to a 6 bed-mixed-dorm. 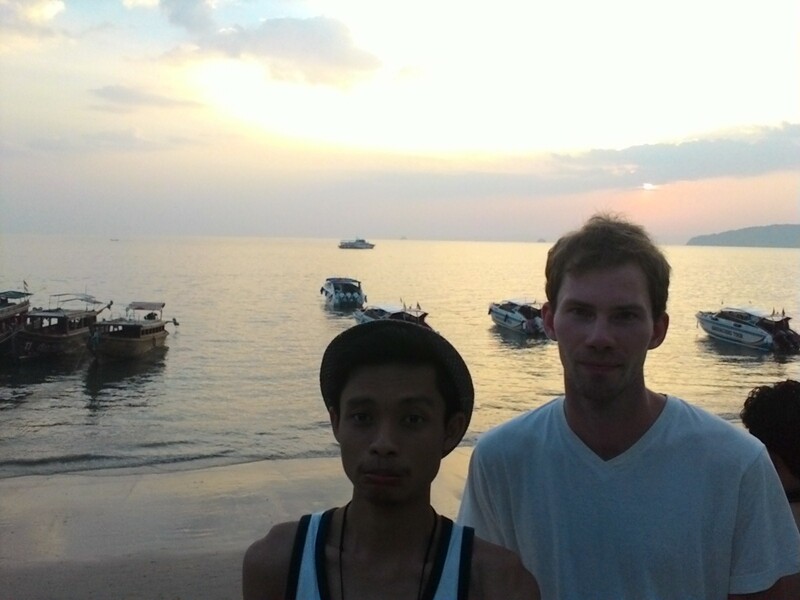 And there, I met Hans from Sweden which turned out to be one of the best company I had throughout the trip. He was so friendly and so approachable and we long talks learning about each other culture. They are other 2 female backpackers from the dorm, the previous from crypus who shifted to my dorm too and the other was from Slovakia. They were friendly but not as engaging as Hans. Another day in Krabi, I really enjoy the stay at the hostel. This time round I decided to go for the Kayaking Sea Cave at Bothor to discover the Big Headed Ghost Cave.Yet again, I meet another solo traveler from Spain, Beñat. We decided to pair up since both of us are travelling alone. He was a great company, learned about the Spanish culture from him and we raced against other kayaks to be the fastest. That night, Hana and I planned for dinner together, my final one in Krabi. We head to a random skyroof restaurant which serve a great green curry.We plenty of laughters together and I’m happy to sum up the night in Ao Nang. When I got back to the hostel, and I decided to approached Hans who was on the on the way out to tag along with him for street food hunting. Gotta catch my morning flight. I packed up my bags with a heavy heart. The feeling to leave my awesome friends made in my 2nd attempt of solo backpacking. Its the feeling that you will never see them again. Well, that happens during travelling and I will always cheerish the people i met here. The most important thing i picked up from the journey is, Travelling is not always about the places you go, but the friends you made along your adventure. I may miss out key attractions but it is the moments here that I could hardly forget in my entire life. Well, it is time to catch my flight home. 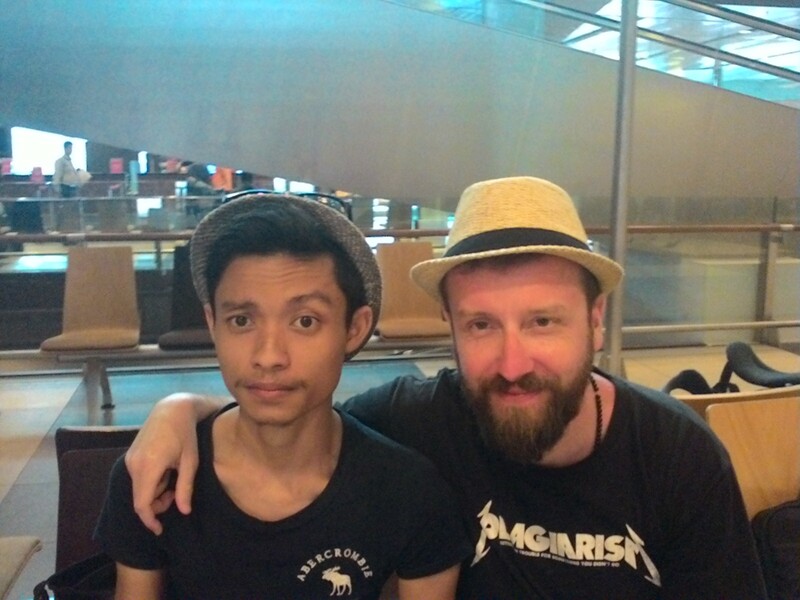 When i was in the flight heading back home,i met Rafal, a Polish guy was seating next to me. He was looking lost and I caught a glimpse of him searching for hostels in Singapore. I decided to approach him and lend him a helping hand finding a hostel and briefly taught him how to get around in Singapore. You will never know who will return a favour for your good deeds. Definitely a great way to sum up my trip. Its a simple, nothing fancy and some might call it boring, but I’m happy enough to create my own adventure and building international connections. Hey there! U r doing what all that i’ve planned to do at krabi? Can you give me a price range for the 4 island trip and emerald pool package u went to? I didn’t had enough time to do everything i wanted here. The price range was around 699-899 baht for both. Just bargain. Thanks! do they have a cliff diving and snorkelling package? i heard the cheapest place to bargain is in ao nang. There no cliff diving spots there. Only deep water soloing in railay.Island hopping includes snorkeling. Just pay 50baht for the rental or you can use your own gears. Packages are everywhere around ao nang its very convenient. 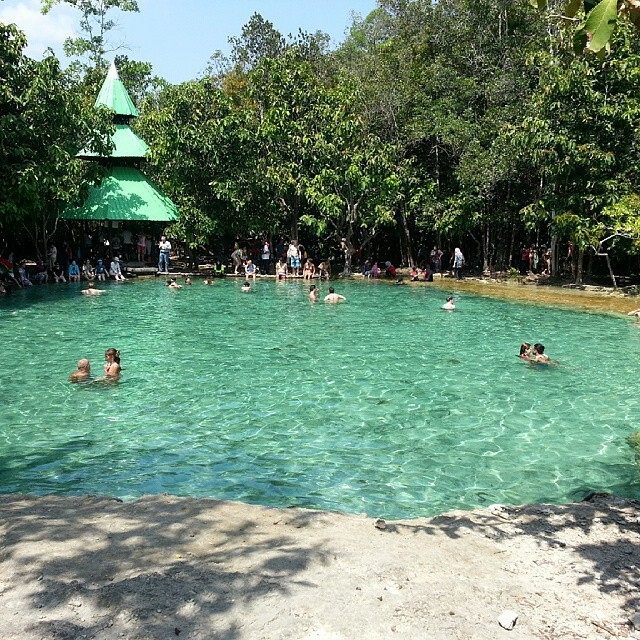 For the tour (Tiger Cave, Emerald Pool and Hot Stream), you book online or? Any tour guide to recommend? No i didn’t book any. There are plenty of tour package at the street in Ao Nang just make the right bargain.